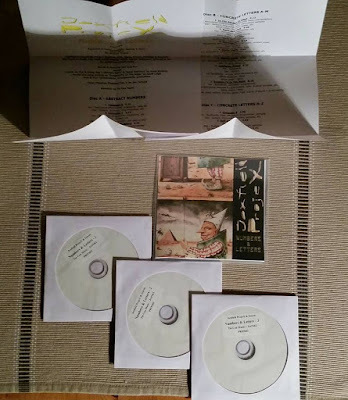 Joxfield ProjeX - Numbers & Letters (3 x CDR + 2 x A4 info insert Tin Can Music 2010). This is a release that more or less don't exist as it was meant to be a free donwload album. But today I made a copy for a guy in the US on his nice request and will send it to him this week. It's 2½ hours of very diverse music and features guest apperances from Geoff Leigh, Nikke Ström, Pat Mastelotto, José João Loureiro, Kenji Siratori, Regina P, Hiromichi Sakamoto, Churner, Håkan Almkvist and with a beautiful cover painting by Jan Ternald. What do you think? Anyone open for discussion? Incredible musical document. Thank you.